Kombiner to populære søfarendeaktiviteter på denne lille gruppe fiskeri udflugt fra Reykjavik. Spot puffins som du krydser forbi deres ø kolonier og find en god fiskeri stedet at kaste din linje. Fiskeri med guider betyder, at chancerne for at fange fisk er øget og eliminerer besværet med at organisere bådudlejning uafhængigt. 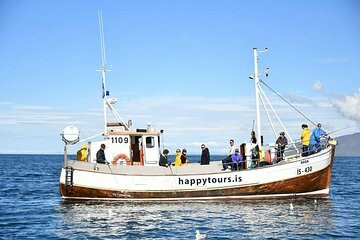 Tilbage i Reykjaviks gamle havn, vil du nyde et hjemmelavet måltid lavet med fisken du fanger. We booked the half day fishing trip for my husband who loves to fish. He caught the first, the most and the biggest fish - mostly cod, but some haddock and whiting as well - at least a dozen total. We were only in the bay but the captain knows the area well and I have to think he always comes home with fish. He knows the best spots. We got lucky that the weather was beautiful with blue skies and calm seas. Our captain pan fried the fish when we got back and served it with some potatoes - super YUM! Fantastic fishing experience with father (captain) and daughter. Tons of fishes, mainly cod, and get to eat your catches when back at the harbor. Loved it! The boat was easy to fine. There were 10 passengers/guests in total. We were greeted by the captain and his first mate son. They offered outerwear protection jackets, pants, and boots, which I recommend you accept. Everything was clean and in excellent condition. They also had binoculars for everyone, which came in handy when viewing the puffins. The first mate gave each passenger a bated 3-hook rod and an intro to fishing. He checked on each passenger and removed every fish as it was reeled in. We moved to several different locations and everyone on board contributed a catch to our meal. My husband caught 7 fish - a lifetime high. The captain cleaned and cooked the fish cod and haddock, sharing his secret ingredient. The first mate set up the buffet, which also included potatoes, sweet chili sauce with skyr, and water. We could eat as much as we wished. It was all delicious. We were never rushed and enjoyed the conversation the other passengers, who came from a variety of countries. I highly recommend this outing. Thank you, Captain. This was a fun trip, we saw puffins and caught a few fish. Unfortunately, the trip was scheduled for 11:00 but the boat and passengers weren't ready to go until 11:20 and then it took 30 min to get to the fishing area. After about 70-80 min, we reeled in the poles and headed back so what was touted as 2-2.5 hr of fishing turned out to be just barely more than an hour of actual fishing. Felt like we were part of the family! Fun for 3 generations.